Plastid ribosomal proteins (PRPs) play important roles in the translation of key proteins involved in chloroplast development and photosynthesis. PRPs have been widely studied in many plant species; however, few studies have investigated their roles in rice. In the present study, we used ethyl methane sulfonate mutagenesis and obtained a novel rice mutant called white green leaf 2 (wgl2). The wgl2 mutants exhibited an albino phenotype from germination through the three-leaf stage, and then gradually transitioned to green through the later developmental stages. Consistent with this albino phenotype, wgl2 mutants had abnormal chloroplasts and lower levels of photosynthetic pigments. Map-based cloning and DNA sequencing analyses of wgl2 revealed a single-nucleotide substitution (G to T) in the first exon of LOC_Os03g55930, which resulted in a substitution of glycine 92 to valine (G92 V). WGL2 encodes a conserved ribosomal protein, which localizes to the chloroplast. Complementation and targeted deletion experiments confirmed that the point mutation in WGL2 is responsible for the wgl2 mutant phenotype. WGL2 is preferentially expressed in the leaf, and mutating WGL2 led to obvious changes in the expression of genes related to chlorophyll biosynthesis, photosynthesis, chloroplast development, and ribosome development compared with wild-type. WGL2 encodes a conserved ribosomal protein, which localizes to the chloroplast. WGL2 is essential for early chloroplast development in rice. These results facilitate research that will further uncover the molecular mechanism of chloroplast development. The development of chloroplasts from proplastids involves plastid replication and activation of plastid DNA synthesis, chloroplast genetic system “build-up”, and synthesis and assembly of the photosynthetic apparatus. These steps are regulated by the coordinated expression of nuclear and plastid genes (Kusumi et al. 2010; Kusumi et al. 2011; Mullet 1993). Transcription of chloroplast genes depends on the nucleus-encoded RNA polymerase (NEP) and the plastid-encoded RNA polymerase (PEP) (He et al. 2018; Hedtke et al. 1997; Qiu et al. 2017; Shiina et al. 2005). Plastid and chloroplast development are affected by NEP and PEP throughout plant growth (Qiu et al. 2017). During chloroplast development, NEP preferentially transcribes plastid housekeeping genes, such as those encoding the PEP apparatus, rRNA, and tRNA, and the overall transcriptional and translational activities in the chloroplast dramatically increase (Hajdukiewicz et al. 1997). Later in chloroplast development, NEP becomes less important and chloroplast genes are transcribed by PEP (De Santis-MacIossek et al. 1999), and translated by the ribosomal complex (Pogson and Albrecht 2011). Ribosomes are essential for protein synthesis, and in plants the ribosomes catalyze protein synthesis in the cytoplasm, plastids, and mitochondria (Zhang et al. 2016). Plastid ribosomal proteins (PRPs) play important roles in the build-up step of chloroplast differentiation. Plastid proteins are translated by the 70S ribosome, which consists of one small (30S) and one large (50S) ribosomal subunit; these have bacterial orthologs (Subramanian 1985). The small subunit consists of the 16S rRNA and 24 PRPs, including 12 proteins encoded by plastid genes and 12 encoded by nuclear genes (Yamaguchi and Subramanian 2003). The large subunit consists of three rRNAs (23S, 5S, and 4.5S) and 33 PRPs, including 8 proteins encoded by plastid genes and 25 encoded by nuclear genes (Yamaguchi et al. 2003). The essential and non-essential PRPs are partially conserved between bacteria and chloroplasts. Interestingly, some ribosomal proteins are not essential for the bacterial ribosome, but are essential for chloroplasts (Tiller and Bock 2014). Since PRPs are crucial for plant growth and development, the lack of PRPs can affect protein synthesis and result in diverse phenotypes. Due to the lack of the plastid small subunit protein 17 (PRPS17), the maize high chlorophyll fluorescent 60 (hcf60) mutant has a seedling-lethal phenotype (Schultes et al. 2000). The maize lethal embryo 1 (lem1) mutant contains a mutation in the gene encoding a protein that is similar to the rice PRPS9, and lem1 mutants have an early embryonic death phenotype (Ma and Dooner 2004). The tobacco mutant plastid ribosomal protein S18 (prps18) displays defects in leaf development (Rogalski et al. 2006). The plastid-encoded proteins RPL33 and RPS15 are required under certain environmental conditions in tobacco, and improve ribosome biogenesis efficiency at elevated temperatures (Ehrnthaler et al. 2014; Rogalski et al. 2008). Plastid proteins play essential roles in embryo development, which has been shown with various plastid ribosomal protein mutants in Arabidopsis (prps5, 9, 13, 20 and prpl1, 4, 6, 10, 13, 18, 19, 21, 22, 27, 28, 31, 32, 35, 36) (Gong et al. 2013; Wang et al. 2017a). The Arabidopsis plastid ribosomal protein S5 (RPS5) plays a role in photosynthesis, plant development, and cold tolerance (Zhang et al. 2016). In rice, the PRP mutants albino seedling lethality 1 (asl1), albino seedling lethality 2 (asl2), and albino lethal 1(al1) show albino and seedling lethality phenotypes (Gong et al. 2013; Lin et al. 2015; Zhao et al. 2016). ASL1 encodes the plastid 30S ribosomal protein S20 (RPS20), ASL2 encodes the chloroplast 50S ribosome protein L21, and AL1 encodes the PRPL12 protein. WLP1 encodes the plastid ribosomal protein L13 and TCD11 encodes the small ribosomal subunit protein S6 (RPS6). The rice white leaf and panicles 1 (wlp1) and thermo-sensitive chlorophyll-deficient mutant 11 (tcd11) mutants display albino phenotypes at low temperatures, suggesting that both genes are required for normal chloroplast development, especially under low temperature conditions (Song et al. 2014; Wang et al. 2017a). Although many PRPs have been studied in plants, few have been studied in rice. In the present study, we obtained a novel rice mutant, white green leaf 2 (wgl2); this mutant exhibited an albino phenotype at the seedling stage and recovered green leaves at later stages. 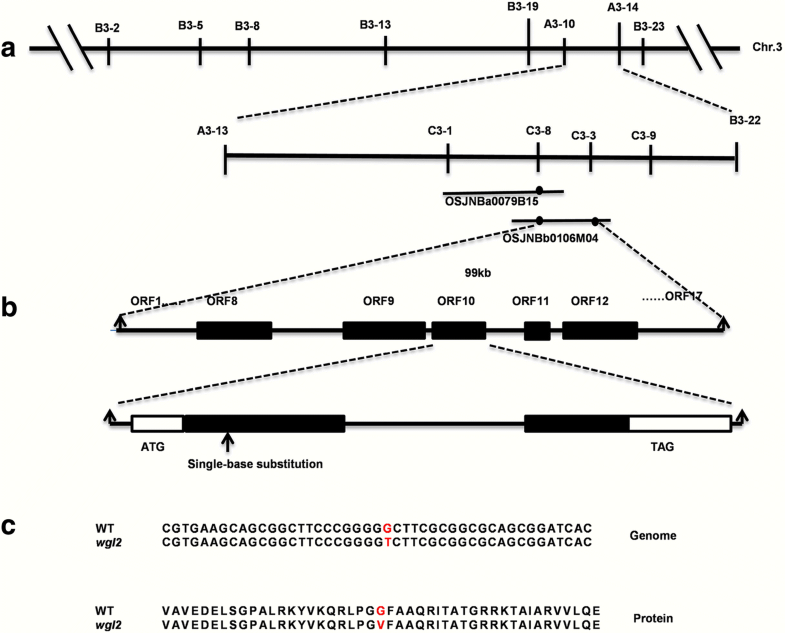 Map-based cloning revealed that WGL2 encodes a ribosomal protein. Our results suggest that the PRP WGL2 plays a vital role in the early development of chloroplasts in rice. A novel rice albino mutant named wgl2 was isolated from the japonica rice cultivar NPB that had been subjected to ethyl methane sulfonate mutagenesis. The wgl2 mutant exhibited an albino phenotype from germination through the three-leaf stage, and then gradually turned from albino to green through the later stages of development (Fig. 1a, b, c). Consistent with the albino phenotype, wgl2 mutants had lower Chl a, Chl b, and Car contents relative to the wild type (NPB). Moreover, the total chlorophyll content of wgl2 and the ratio of Chl a/b were much lower than in the wild type (Fig. 1d). When wgl2 exhibited green leaves at later stages of development, its Chl and Car contents recovered, but were still lower than wild type (Fig. 1e). Abnormal chloroplast development usually leads to lower total chlorophyll contents (Sakamoto et al. 2009). To examine whether chloroplast development was affected in wgl2 albino seedlings, we analyzed the chloroplast ultrastructure of wild-type and wgl2 seedlings at the three-leaf stage with transmission electron microscopy. We observed normal chloroplasts in wild-type plants, with dense and well-structured grana stacks. By contrast, the wgl2 albino mutant had chloroplasts with disrupted architecture, as well as no stromal thylakoids or stacked grana thylakoids, instead displaying oval-shaped vesicles (Fig. 2). These results suggest that wgl2 albino mutant is severely defective in chloroplast development. To explore the molecular mechanism responsible for the wgl2 mutant phenotype, we generated an F2 population by crossing the wgl2 mutant with the indica cultivar TN1 to generate a segregating population. All F1 plants displayed a normal green phenotype, and segregation occurred in the F2 plants that were selfed from the heterozygous F1 plants. Of the 528 F2 plants, 409 showed a normal green leaf phenotype and 119 showed the albino phenotype. The segregation ratio of wild-type to albino phenotypes among the F2 population was consistent with a 3:1 ratio (χ2 = 1.75 < χ2 0.05 = 3.84). These results suggest that the wgl2 mutant phenotype is determined by a single recessive nuclear gene. Using 21 F2 mutant individuals, the WGL2 locus was roughly mapped to the region between the markers A3–10 and A3–14 on the short arm of chromosome 3 (Fig. 3a). To fine map the WGL2 locus, we designed additional sequence-tagged site markers. By using these and more than 1500 genotypes, the location of WGL2 was narrowed down to a 99-kb region between markers C3–8 and C3–3, a region that includes 17 putative open reading frames (ORF: http://rice.plantbiology.msu.edu) (Fig. 3b, Additional file 1: Table S5). DNA sequence analysis of each putative ORF in the wgl2 mutant revealed the presence of a single nucleotide substitution (G➔T) in the first exon of LOC_Os03g55930, which resulted in a Gly-to-Val substitution at the 92nd residue (G92 V, Fig. 3c). The gene is 672 bp long, includes two exons and one intron, and encodes a 224 amino acid polypeptide (Fig. 3b). We used Swiss Model (http://swissmodel.expasy.org/) to predict three-dimensional structures for both wild-type and mutant forms of the WGL2 protein and did not observe any obvious structural differences (Biasini et al. 2014). To confirm that the albino phenotype was attributable to the detected mutation in WGL2, we constructed a complementation vector with a wild-type genomic fragment containing the entire coding region of WGL2, along with 2122 bp of upstream sequence and 281 bp of downstream sequence. The fragment was inserted into the binary vector pCAMBIA1300 to make pCAMBIA1300-WGL2 (Additional file 1: Table S3), which was introduced into the wgl2 mutant by Agrobacterium-mediated transformation. As expected, 15 independent transgenic T0 lines (pCAMBIA1300-WGL2/wgl2) showed a normal phenotype, whereas the wgl2 plants that were transformed with the empty vector showed an albino phenotype that was similar to that of the wgl2 mutant (Fig. 4a). Consistent with this, the T1 plants derived from the T0 plants (pCAMBIA1300-WGL2/wgl2) displayed either green or albino phenotypes, and all of the green seedlings were found to contain the transgene. Additionally, we used CRISPR/Cas9 to generate mutant alleles of WGL2 in a wild-type background and obtained 9 independent T0 transgenic lines that all carried homozygous mutations. Although each line with a homozygous OsWGL2 phenocopied the wgl2 mutant, it exhibited a seedling lethal phenotype. (Fig. 4c, d). Quantitative RT-PCR analysis demonstrated that WGL2 expression in pCAMBIA1300-WGL2/wgl2 complemented transgenic plants was similar to that in the wild type, whereas WGL2 transcript levels were increased in the wgl2 mutant and in all three independent wgl2cas lines compared to the wild type (Fig. 4b, e). These results support the idea that WGL2 is LOC_Os03g55930 and its mutation is responsible for the wgl2 mutant phenotype. To explore the subcellular localization of WGL2, the full-length WGL2 coding sequence lacking its stop codon was used to construct the pWGL2-GFP vector (Additional file 1: Table S3). The pWGL2-GFP plasmid was transformed into rice protoplasts, and an empty GFP vector was used as a negative control. The green fluorescent signal of pWGL2-GFP transformants overlapped with the chlorophyll autofluorescence signal from chloroplasts, whereas the empty GFP vector was observed in the cytoplasm and the nucleus (Fig. 5). These results affirm that WGL2 localizes to the chloroplast. The C-terminal region of chloroplast proteins is often crucial for protein stability, binding with other proteins, photophosphorylation, and trafficking to the chloroplast envelope (Bals et al. 2010; Dünschede et al. 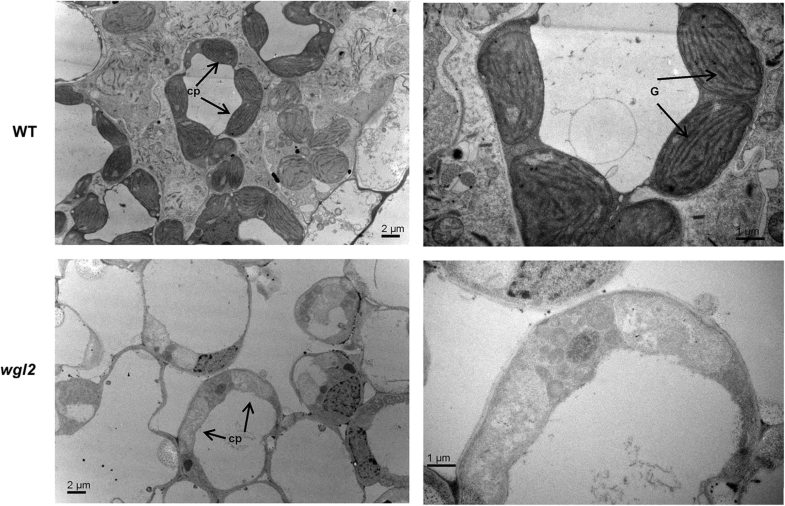 2011; Lung and Chuong 2012; Urbischek et al. 2015). 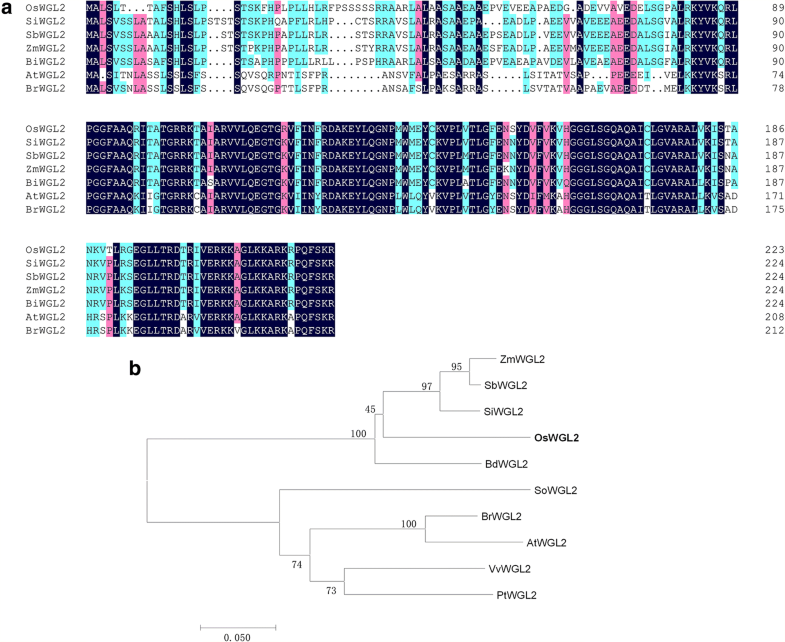 BLAST-P analysis of the NCBI database showed that the WGL2 C-terminal belongs to the ribosomal S9 super family, and is highly conserved in higher plants including Setaria italica, Zea mays, Brachypodium distachyon, Brassica rapa, and Arabidopsis thaliana (Fig. 6a). Among these species, WGL2 from rice exhibited the highest similarity to the orthologs in Sorghum bicolor (81%), Setaria italic (80%), and Zea mays (79%). To investigate the evolutionary relationship among WGL2 homologs, a phylogenic analysis was performed (Fig. 6b). The results show that WGL2 homologues can be clearly divided into two groups: monocots and dicots, and that OsWGL2 is closely related to the grass family containing maize and sorghum. These results demonstrate that the WGL2 protein is a ribosomal S9 protein that is highly conserved in plants. To examine the WGL2 expression pattern in wild-type plants, total RNA was extracted from various organs including young roots, uppermost internodes, flag leaves, leaf sheaths, and young panicles. 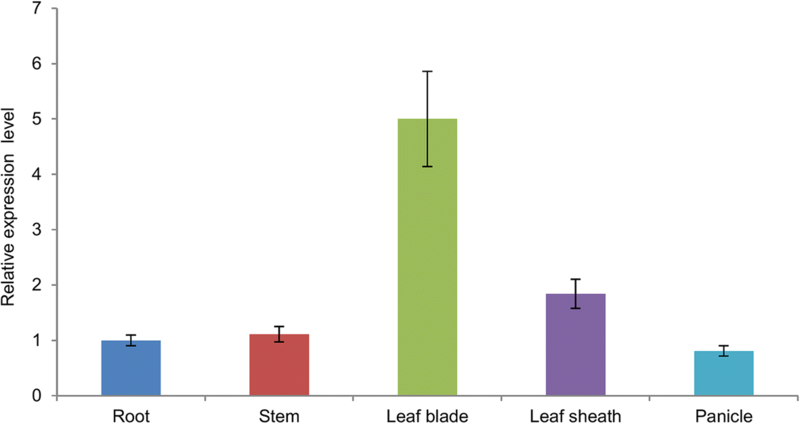 We detected a dramatic increase in WGL2 expression in flag leaves, and a slight increase in the leaf sheath compared to that in the other organs (Fig. 7). This further supports a role for WGL2 in chloroplast development in rice leaves. Given that WGL2 is a chloroplast nucleoid-localized ribosomal protein, we considered the possibility that it might affect the expression of genes related to chloroplast development. Therefore, we measured transcript levels of 13 representative genes associated with Chl biosynthesis, photosynthesis, and chloroplast development with qRT-PCR (Fig. 8a, c). The transcript levels of the Chl biosynthesis genes encoding Mg chelatase H subunit (CHLH), chlorophyll a oxygenase1 (CAO1), protochlorophyllide A (PORA), and divinyl reductase (DVR) decreased in the wgl2 albino leaves compared to the wild type (Fig. 8a). However, the transcript level of DVR in wgl2 green leaves that were showed at later stages of development was 2.7 times higher than in wild-type leaves (Fig. 8c). Chloroplast biogenesis and physiological changes are tightly regulated by the coordination of NEP and PEP. We observed that the expression of PEP-dependent photosynthesis genes including psaA, and psbA, which encode core components of Photosystem I, and rbcL, which encodes the large subunit of Rubisco, were lower in wgl2 albino leaves than in the wild-type leaves (Fig. 8a). The expression of NEP-dependent genes, including the RNA polymerase subunit genes RpoB, RpoC1, and RpoC2 was higher in wgl2 albino leaves compared with the wild type. Moreover, the AtpB and AtpE NEP/PEP-dependent genes were strongly inhibited in wgl2 albino leaves compared with the wild type. The expression levels of these genes in wgl2 green leaves were different from the levels in wgl2 albino leaves and in wild-type leaves. For example, the transcript levels of the RNA polymerase subunit genes RpoB, RpoC1, and RpoC2 were obviously lower in wgl2 green leaves compared with wild-type leaves (Fig. 8c). In addition, we examined the expression of genes related to ribosome development (Fig. 8b, d). We found that 16S rRNA, 23S rRNA, rps7, and rps18 were severely suppressed in the wgl2 albino mutant compared with the wild type, especially the 16S rRNA and 23S rRNA that were almost undetectable. Nevertheless, rps10, rps16, rps20, and rpl21 were up-regulated in the wgl2 albino mutant, of which, the increase in rpl21 expression was the most dramatic. When the expression levels of these genes were detected in wgl2 green leaves and wild-type, 16S rRNA levels were higher in wgl2 green leaves than in wild-type, and 23S rRNA and rps7 were similar between wgl2 green leaves and wild type; however, the remaining genes were down-regulated in wgl2 green leaves compared with the wild-type. These data show that the mutation in WLG2 results in abnormal expression of genes related to chloroplast development, photosynthesis, and chloroplast RNAs, which may be responsible for the albino phenotype observed in wlg2 albino seedlings. When chloroplast development and chlorophyll biosynthesis are disrupted, plants usually exhibit a variety of leaf color phenotypes (Jung et al. 2003). Plastid ribosomal proteins are crucial in ribosome biogenesis, plastid protein biosynthesis, and early chloroplast development (Lin et al. 2015). Many plastid ribosomal protein mutants have been identified in higher plants, and certain plastid ribosomal proteins have been shown to have roles in diverse biological processes in Arabidopsis (Romani et al. 2012). However, few studies have investigated the functions of PRPs in rice. The first rice PRP mutant reported was the asl1 mutant, which shows an albino lethal phenotype at the seedling stage (Gong et al. 2013). The nuclear gene ASL1 encodes PRPS20 and the asl1 mutation results in abnormal expression of genes related to chlorophyll biosynthesis, photosynthesis, chloroplast development, and plastid ribosome assembly. 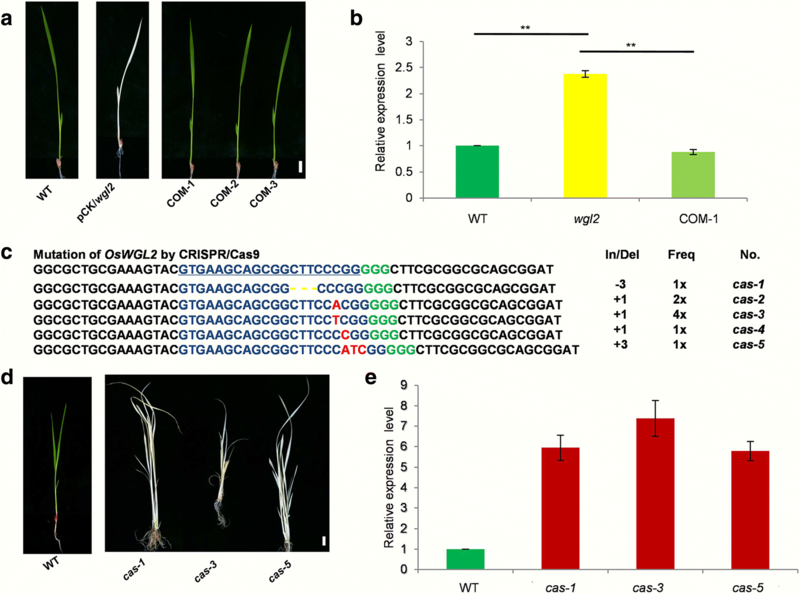 The rice PRP mutants asl2 and albino lethal 1 (al1) also show similar albino and seedling lethal phenotypes, as well as a reduction in expression of the 23S rRNA involved in plastid ribosome assembly. ASL2 and AL1 encode PRRL21 and PRPL12, respectively, both of which participate in ribosome assembly (Lin et al. 2015; Zhao et al. 2016). Additionally, the rice PRP mutant white leaf and panicles 1 (wlp1) displays an albino phenotype at low temperatures, which is similar to the thermo-sensitive chlorophyll-deficient mutant 11 (tcd11) mutant. WLP1 encodes PRPL13, and TCD11 encodes PRPS6. Both WLP1 and TCD11 are necessary for normal chloroplast development, especially at low temperatures (Song et al. 2014; Wang et al. 2017a). In this study, a seedling albino rice wgl2 mutant was identified and consistent with its albino phenotype, showed altered pigment content and disordered chloroplast development (Figs. 1a, d and 2). The wgl2 mutant had a single nucleotide substitution (G➔T) in the first exon of LOC_Os03g55930, which resulted in a Gly-to-Val substitution at 92nd residue (Fig. 3c). According to the RGAP database (http://rice.plantbiology.msu.edu/index.shtml), WGL2 encodes a ribosomal protein. We found that the WGL2 protein localizes to the chloroplast (Fig. 5). Therefore, we supposed that WGL2 is a type of PRP. Furthermore, a BLASTP analysis in the NCBI database showed that the C-terminal of WGL2 belongs to the ribosomal S9 super family and it is highly conserved among chloroplast 30S ribosomal S9 proteins of higher plants (Fig. 6a). According to the NCBI database, WGL2 is the only gene that encodes a ribosomal S9 protein in rice. The process of plastid formation from a proplastid to a photosynthetically active chloroplast is controlled by NEP and PEP (Hedtke et al. 1997; Shiina et al. 2005). The coordination of NEP and PEP expression plays an important role in chloroplast differentiation. The transcript levels of 13 representative genes associated with Chl biosynthesis, photosynthesis, and chloroplast development were assessed by qRT-PCR (Fig. 8a, c). We found that the expression of PEP-dependent photosynthesis genes, such as psaA, psbA, and rbcL were severely reduced in the wgl2 mutant, which could possibly be related to the deficiency in chloroplast ribosomes. However, the transcript levels of NEP-dependent genes, such as the RNA polymerase subunits RpoB, RpoC1, and RpoC2 increased in wgl2 albino mutant compared with the wild-type (Fig. 8a), decreased in wgl2 green seedlings compared with the wild-type (Fig. 8c). This increase in expression of NEP genes may be caused through feedback mechanisms to overcome the reduced translation of PEP genes in the chloroplast because NEP preferentially transcribes plastid house-keeping genes, including PEP core subunits and genes associated with basic plastid functions. In addition, the decrease in transcripts of nuclear genes involved in Chl biosynthesis (CHLH, CAO1 and PORA) is probably due to the disruption of chloroplast development at the chloroplast build-up step. Consequently, the wgl2 albino or green plants have lower Chl a, Chl b, and Car contents than the wild type (Fig. 1d, e). A BLAST-P analysis using the NCBI database shows that WGL2 has high sequence identity with chloroplast 30S ribosomal protein S9 from multiple plant species. Our observations show that the expression of the chloroplast-associated 16S and 23S rRNAs were dramatically reduced in the wgl2 albino mutant compared to the wild type, and that other genes related to ribosome development also displayed abnormal expression (Fig. 8b). However, most of these genes expression levels in wgl2 green and wgl2 albino were opposite, especially 16 rRNA, rps10, rps20, and rpl21 (Fig. 8b, d). The transcript abundance of WGL2 was higher than the wild type in both the wgl2 point mutant and the CRISPR/Cas9 transgenic wgl2 mutant lines, which may result from feedback effects (Fig. 4b, e). These results are similar to those observed for the rice wlp1 and al1 mutants (Song et al. 2014; Zhao et al. 2016), and show that mutation of the WGL2 gene hinders Chl biosynthesis, photosynthesis, chloroplast development, and ribosome development in chloroplasts, thereby leading to the observed phenotype in the wgl2 mutant. RPS9 is widely conserved in yeast, bacteria, protists, mammals, humans, and plants (Wen et al. 2017). RPS9 plays crucial roles in many biological processes such as the early stages of ribosome biogenesis, regulation of mRNA translation, and normal cell growth and proliferation (Ferreiracerca et al. 2007; Lindström and Nistér 2010; Lindström and Zhang 2008; Pnueli and Arava 2007). RPS9 in rice has high sequence identity with maize PRRS9, which is disrupted by the lethal embryo 1 (lem1) mutant; however, the lem1 mutant displays an early embryo lethality phenotype instead of the albino phenotype observed in the wgl2 mutant in rice (Ma and Dooner 2004). In contrast, the null rps9 mutant in bacteria is not lethal, but has a cold-sensitive phenotype. Since single-base substitution is not lethal in the rice wgl2 mutant, the mutant WGL2 protein may be partially functional. Interestingly, we used the CRISPR/Cas9 system to obtain nine independent homozygous T0 transgenic lines, which show albino and seedling-lethal phenotypes, indicating that the OsWGL2 loss-of-function hinders chloroplast development and fails to recover the albino seedling phenotype. These phenotypic differences may be due to different functions of RPS9 in different species and different mutations of RPS9 in the same species. Many studies have shown that leaf color mutants can transition from abnormal phenotypes to normal phenotypes, and that this transition is primarily affected by environmental conditions, especially light and temperature. 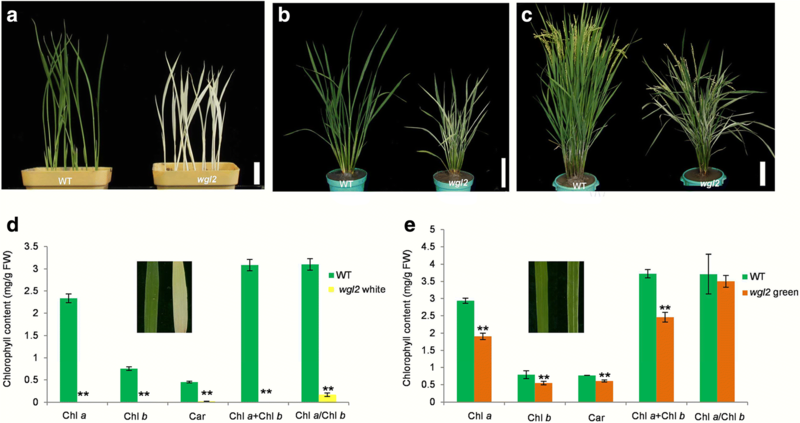 The rice temperature-sensitive virescent (tsv) mutant displays a normal green phenotype at high temperatures, whereas the rice heat-stress sensitive albino 1 (hsa1) mutant shows normal phenotypes at low temperatures (Qiu et al. 2017; Sun et al. 2017). Light is an important factor in the differentiation of non-photosynthetic proplastids into fully functional, photosynthetic chloroplasts, and affects the expression of genes associated with chloroplast development (Gong et al. 2013; Su et al. 2012; Zhao et al. 1999). The transcript levels of ASL1 and ASL2 were higher when exposed to light than in the dark (Gong et al. 2013; Zhao et al. 2016). In this study, the rice wgl2 mutant exhibited the albino phenotype from germination through the three-leaf stage, and then gradually turned from albino to green during the later stages of development (Fig. 1a, b, c), which may be also affected by environmental conditions. However, further experiments will need to be done to investigate the impact of light and temperature on the wgl2 mutant phenotype to elucidate the role of these environmental factors. Rice WGL2 encodes a conserved ribosomal protein, which localizes to the chloroplast. WGL2 is essential for early chloroplast development in rice. These results will facilitate efforts to further uncover the molecular mechanism of chloroplast development. 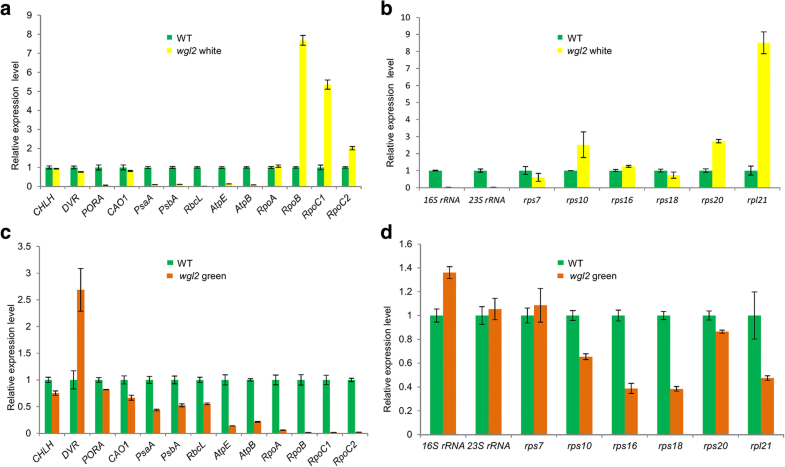 The wgl2 mutant was obtained by mutagenizing the Oryza sativa japonica cultivar Nipponbare (NPB) with ethyl methane sulfonate (Qian et al. 2016). The F2 segregating population was generated by crossing the wgl2 mutant with the indica cultivar Taizhong Native 1 (TN1) and was used for fine mapping wgl2. All plants in this study were grown under natural conditions in the paddy field at the China National Rice Research Institute located in Fuyang, Zhejiang province (119°6′E, 30°0′N). Pigments were extracted from fresh leaf samples (0.03 g) from wild-type and wgl2 plants that were cut into small segments and incubated with 3 ml of 80% acetone in the dark for 48 h. The supernatant was measured with an ultraviolet spectrophotometer (DU800, BECKMAN, Fullerton, USA) at 470, 645, and 663 nm. Total chlorophyll (Chl), Chl a, Chl b, and carotenoid (Car) contents were measured according to the methods by Arnon (1949) and Wellburn (1994) (Arnon 1949; Wellburn 1994). Three biological replicates were analyzed for each condition. For TEM analysis, transverse sections of leaf samples were taken from the wgl2 white and NPB seedlings grown in the paddy field at the three-leaf stage. Leaf samples were fixed in 2.5% glutaraldehyde and then in 1% OsO4. Samples were prepared as described previously (Gothandam et al. 2005), and were observed using a Hitachi H-7650 electron microscope (Tokyo, Japan). To map the WGL2 gene, more than 1500 mutant individuals were selected from the F2 population. Genomic DNA (gDNA) was extracted from F2 plants with the CTAB method (Jr and Via 1993). Polymorphic markers between NPB and TN1 were identified using simple sequence repeat (SSR) and sequence-tagged site (STS) markers, and were used to map the wgl2 locus. PCR products were separated by agarose gel (4–5%) electrophoresis. The gDNA fragments containing candidate genes were amplified from mutant and WT and sequenced by the Hangzhou Tsingke Biological Engineering Technology and ServiceCo. Ltd. (Tsingke, Hangzhou, China). For mutant complementation, the gDNA sequence containing the entire coding region of WGL2, 2122-bp upstream and 281-bp of downstream was amplified and sequenced with the 930COMF/R primers (Additional file 1: Table S3). The resulting fragment was inserted into the binary vector pCAMBIA1300. The pCAMBIA1300-WGL2 vector and control vector (pCAMBIA1300, CK) were introduced into the wgl2 mutant by Agrobacterium-mediated transformation. For making wgl2 mutants, the target sequence (GTGAAGCAGCGGCTTCCCGG) was chosen using CRISPRdirect (http://crispr.dbcls.jp) and then confirming its specificity (Naito et al. 2015). For construction of the targeted deletion vector, the first round of PCR was performed in two separate reactions with U3tF/tR1tR- WGL2 and gR2tF-WGL2/gRNA2R2, and the second round of PCR was performed with U3tF/ gRNA2R2 (Additional file 1: Table S3).The targeted deletion phRubi2-Cas9 vector was constructed for the CRISPR/Cas9 system (Wang et al. 2017b) and was introduced into NPB by Agrobacterium-mediated transformation. The predicted full-length WGL2 protein sequence, with 224 amino acids, was obtained from Gramene (http://www.gramene.org/). The sequences used in the phylogenetic analysis were obtained by a BLASTP search using the WGL2 protein sequence as the query at the National Center for Biotechnology Information (NCBI, http://www.ncbi.nlm.nih.gov/). The full-length amino acid sequences were aligned using the DNAMAN program. A neighbor-joining tree was constructed using MEGA version 7.0 software with the bootstrap method and 1000 replicates. The evolutionary distances were computed using the Poisson correction method and reflect the number of amino acid substitutions. All positions containing gaps and missing data were eliminated. To investigate the subcellular localization of WGL2, we amplified the full-length WGL2 coding sequence without the termination codon with primers WGL2-GFPF/R (Additional file 1: Table S3). The resulting fragment was introduced into the GFP vector pCA1301-35S-S65 T-GFP (Ren et al. 2017). The WGL2-GFP vector was transformed into rice protoplasts (Yu et al. 2014), and the transformed protoplasts were observed with a Zeiss LSM700 laser scanning confocal microscope (Car Zeiss, Inc., Thornwood, NY, USA). Total RNA was extracted and purified from different tissues using the AxyPrep total RNA Miniprep Kit (Axygen) according to the manufacturer’s instructions. The cDNA was reverse transcribed using the ReverTraAce quantitative PCR RT Master Mix Kit with gDNA remover (Toyobo) according to the manufacturer’s instructions. Quantitative reverse transcription PCR (qRT-PCR) was performed with a CFX96 Touch Real-time PCR Detection System using the 2× SsoFast EvaGreen SuperMix (Bio-Rad). The rice UBQ5 gene was used as an internal control. All primers for qRT-PCR are listed in Additional file 1: Table S2. The data were expressed as the mean ± SD of three biological replicates. A Student’s t-test was used for statistical analysis. Zhennan Qiu and Dongdong Chen contributed equally to this work. The work was supported by the National Natural Science Foundation of China (Grant No. 31601284); The Transgenic Plant Research and Commercialization Project of the Ministry of Agriculture of China (Grant No. 2016ZX08001003–002); Zhejiang Province Outstanding Youth Fund (Grant No. LR16C130001); The Collaborative Innovation Project of the Chinese Academy of Agricultural Sciences; and the State Key Laboratory of Rice Biology Research Project (2017ZZKT10103). LZ, ZQ, and DC designed the research, performed the experiments, analyzed the data, and wrote the manuscript. LH, SZ, ZY, YZ, ZW, DR, and QQ performed the experiments and analyzed the data. LG provided a critical assessment of the manuscript. ZQ, LZ and LG conceived the project, designed the research, analyzed the data, and wrote the manuscript. All authors read and approved the final manuscript. There are no ethics issues associated with this article. These co-authors involved in the paper all consent to publish this article in Rice.